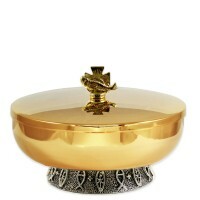 24k goldplated brass Ciborium Bowl with "Fish and PX” motif Resin Base with ancient silver fini..
Chalice and Ciborium with "Fish and Pax” motif Resin Node with ancient silver finishing. Art. 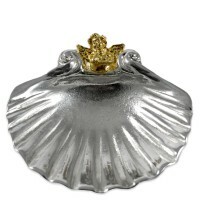 ..
Silver plated baptismal shell with Angel made of 24k goldplated Art.E200 Ø 11 cm. 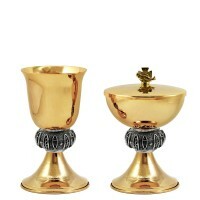 ..
24k goldplated brass Ciborium Bowl with "Grapes” motif Resin Base with ancient silver finishing..
Chalice with "Grapes” motif with ancient silver finishing, engraved around the cup and bas..
Chalice and Ciborium with "Grapes” motif Resin Base with ancient silver finishing. Art. 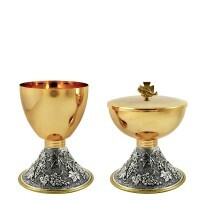 C122&n..
Chalice and Ciborium with "Grapes” motif Resin Base with ancient silver finishing. Art. C120&n..
Art. 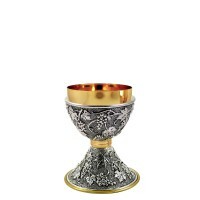 R182-D Mass linens 4 pcs. 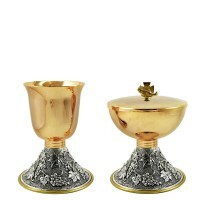 set made of 100% cotton with embroidered Chalice and Grapes Comprises..
Art. 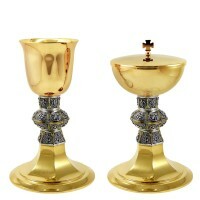 P798N Intinction set made of silvertone plated brass and 24k gold plated with central chalice. ..
Art. 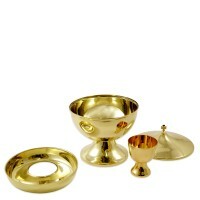 P795 Intinction set made of 24k golden plated brass with central chalice (Art. 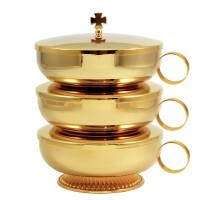 C631) Removing t..
Stacking triple ciboria made of 24k gold plated brass with handle Art. 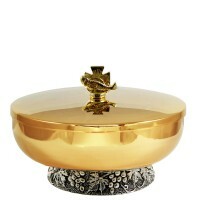 P398 Ciborium Ø 14 cm. ..